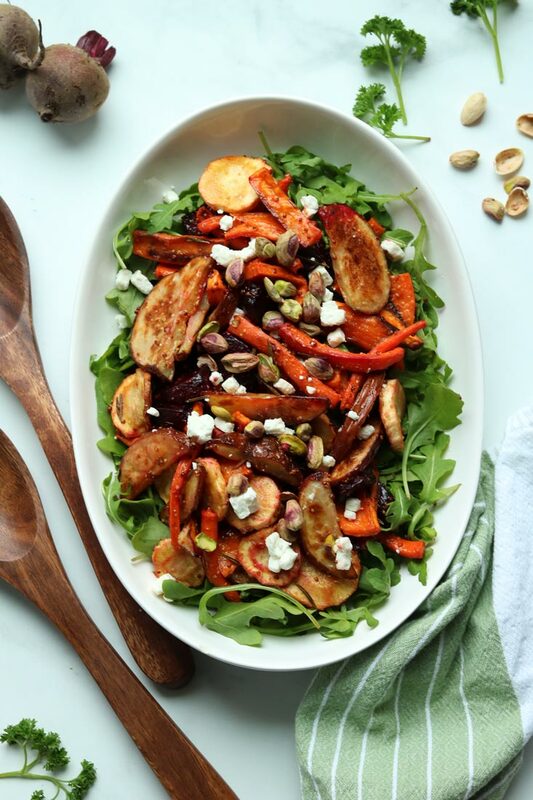 Inside Scoop: This Vibrant & Nourishing Roasted Root Vegetable Salad is the perfect healthy winter side dish. Roasting root veggies is my JAM! I always feel so naturally drawn to root veggies. Even in the summer, baked potatoes, sweet potatoes, beets, carrots and when the squashes come out, I get giddy. So, of course coming up with a delightful and vibrant recipe for a roasted root vegetable salad makes me quite happy. And although I love a good summer root veggie in its raw form, root veggies are much nicer during the cooler months, especially during any holiday season. Root veggies make salads more inviting. Root veggies make side dishes stand out. And, root vegetables can be dressed up in so many different ways, we just absolutely adore them! I think one of the things that I love most about this roasted root vegetable salad is the fact that it can be played up in so many ways. First, you can pick and choose the root veggies you like. If you want to keep it strictly potato and sweet potato, that’s cool. You do you. 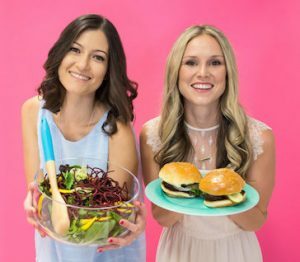 You can also choose to make it vegan, or add some plant-based cheese on it. 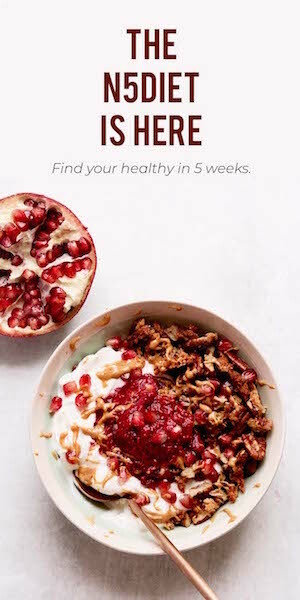 I love to add a sweetness pop to it with dried cranberries or raisins and throw down some healthy fats with nuts and seeds. Pecans have a sweet element and pistachios are by far my favourite nut, so really, the options are kind of endless here. 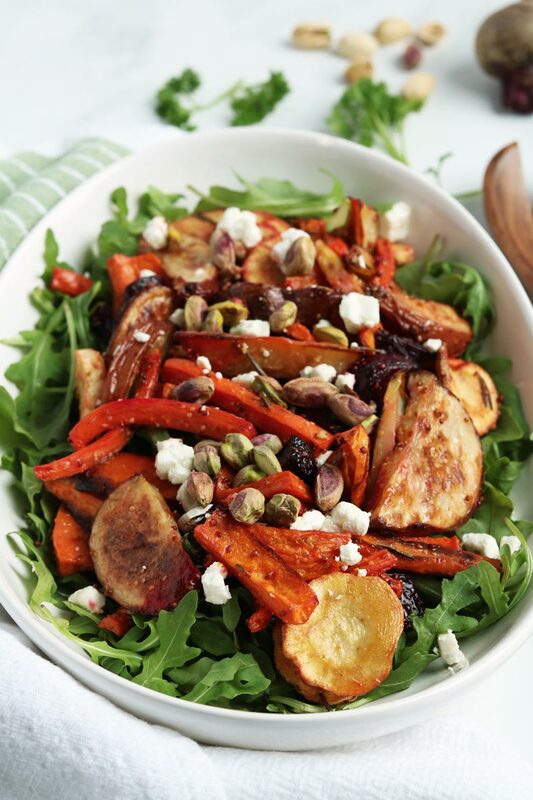 This Vibrant Roasted Root Vegetable Salad is also really filling, but it fills you up in all of the good kind of ways. It’s loaded with prebiotic fibers, healthy, slow release carbohydrates, and a ton of earthy, sweet and subtle flavours that makes for a nourishing, yet really satisfying side dish (or main dish if you’re going there). Pretty, tasty, versatile, yeah winter/ root veggies are pretty amazing. 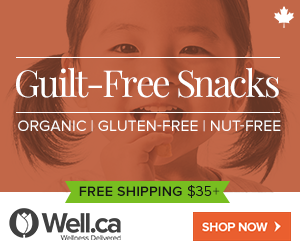 But did you also know that they contain some serious nutritional benefits? Beets are high in folate and iron. They also have been shown to help lower blood pressure, increase physical stamina and they may help fight inflammation. Carrots contain a near 88% water, did you know that? I didn’t until just now researching the benefits. Cool. They also contain fiber and slow release carbohydrates, making them a really filling food. Parsnips are one of the best winter vegetables because as the colder climate kicks in the parsnip grows sweeter. 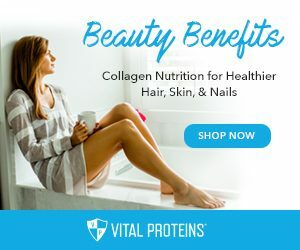 They are also an excellent source of B & E vitamins, and potassium, magnesium and manganese – which means they are great for balancing your electrolytes. 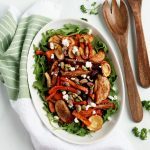 These are just a few key points about some of my favourite veggies in this roasted root vegetable salad, but there are so many other health benefits that it’s a no brainer, making this salad over the winter months – especially the holiday season, is going to take your salad game up a notch. 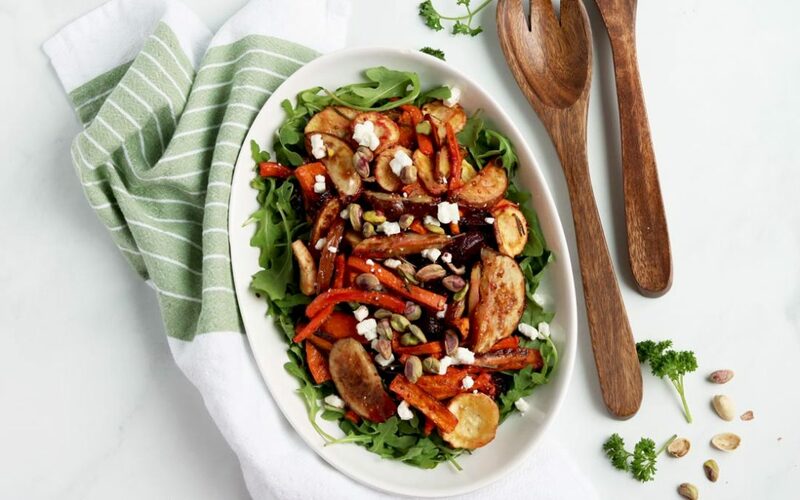 Even if you want to swap out some of the veg in this roasted root vegetable salad for other vegetables like butternut or acorn squash, it would end up tasting just as delicious. I would highly recommend serving this salad up to your guests over the holidays, with this Vegan Mushroom Gravy on the side. 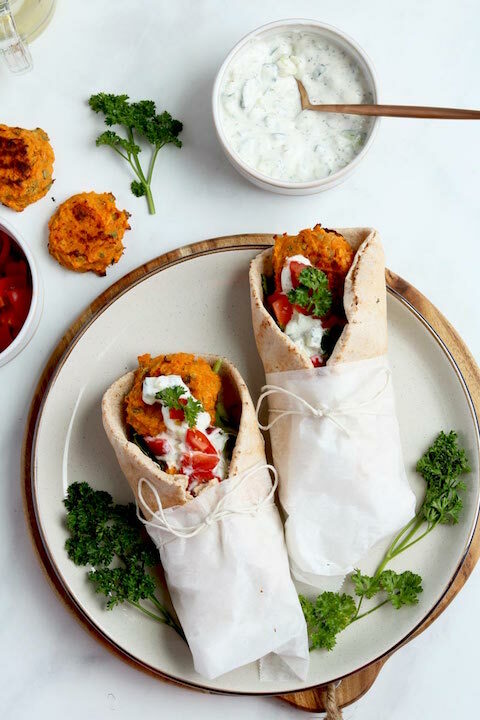 These two recipes are sure to stand out and helps to keep the meal as plant-based friendly as possible, without you even really knowing that there are mostly veggies on the table. Which is my style really. 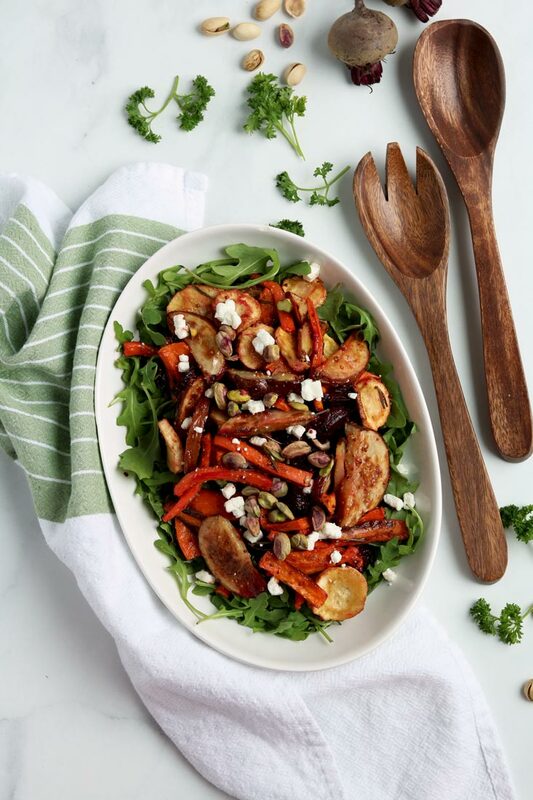 And if you’re looking for some more healthy recipes like this Vibrant & Nourishing Roasted Root Vegetable Salad, you’re going to LOVE this 5 Ingredient Cookbook that we put together just for you. Do you have a favourite winter vegetable? 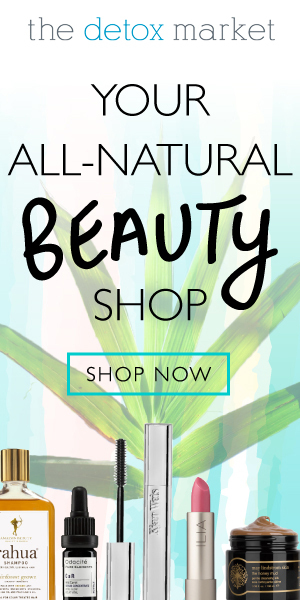 Drop a comment below and let us know! 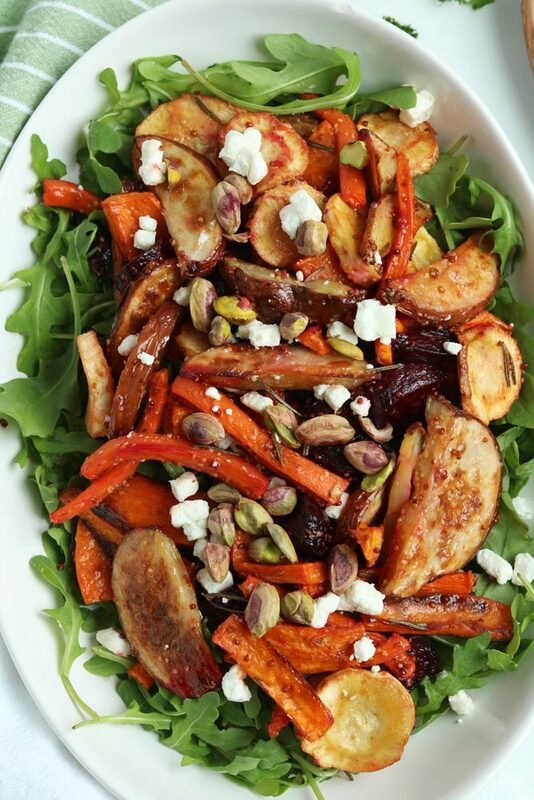 This Vibrant & Nourishing Roasted Root Vegetable Salad is the perfect healthy winter side dish. Preheat oven to 450F and line baking sheet with parchment paper. In a medium bowl toss diced veggies and shallots with 1 Tbsp of coconut oil and 1/2 tsp of salt to coat. Spread veggies out on baking sheet. Roast in oven until veggies are tender (about 25-35 minutes). Drizzle with 1 Tbsp of olive oil and rosemary and toss to coat. Combine remaining oil, mustard and vinegar in a small bowl and whisk with fork until combined. Place arugula in a mixing bowl and drizzle dressing over greens, top with roasted veggies, goat cheese, pistachios and cranberries and toss to coat.